For the complete Bohemian experience, a visit to the Lapa neighborhood of Rio at night cannot be missed, especially if you are a night owl. 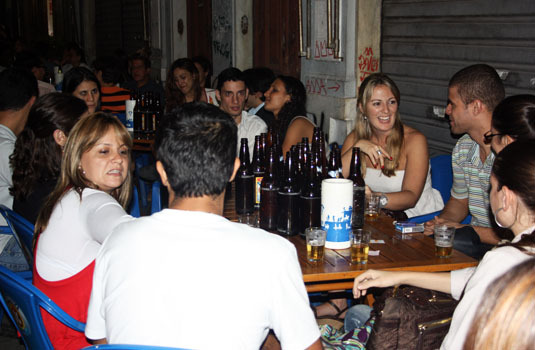 Lapa is unquestionably the best nightlife district in the city. Every street corner, pub, nightclub and bar will have a group of revelers dancing the night away. In the years gone by, Lapa was the favorite haunt of writers and poets who gathered in the neighborhood to pen their thoughts on Rio. In Lapa you can sway to the samba all night long at clubs like Carioca da Gema or move over to Rio Scenarium for some forro, alternative music and live samba bands, in settings that Salvador Dali would be proud of. The very fact that cariocas from Ipanema and Leblon come to Lapa to party is proof enough of the neighborhood’s prowess as a party zone. Friday and Saturday nights are the liveliest if you are looking for a really good time on the party circuit. Samba and Brazilian hip-hop are most popular at bars so you won’t find it difficult to settle in for the night if those are styles that suit you. Rua da Lapa and Rua Joaquim Silva are two streets that are always packed with revelers. If you want to drink, flirt and dance then make sure you head down those two streets, where the heady aroma of cocktails and the sounds of the samba are sure to turn the heat on. Lapa is the birthplace of the samba, so you can feel the rhythm run through your body the moment you enter the neighborhood. If you are around during the months leading up to the Carnival, then you are in for a real treat. Tapping away to the samba beat is sure to make you hungry. To whet your appetite there are plenty of restaurants that offer authentic Brazilian cuisine, a true reflection of the people that represent the city. After a few caipirinhas, you can be sure a delicious treat awaits you available in Lapa.